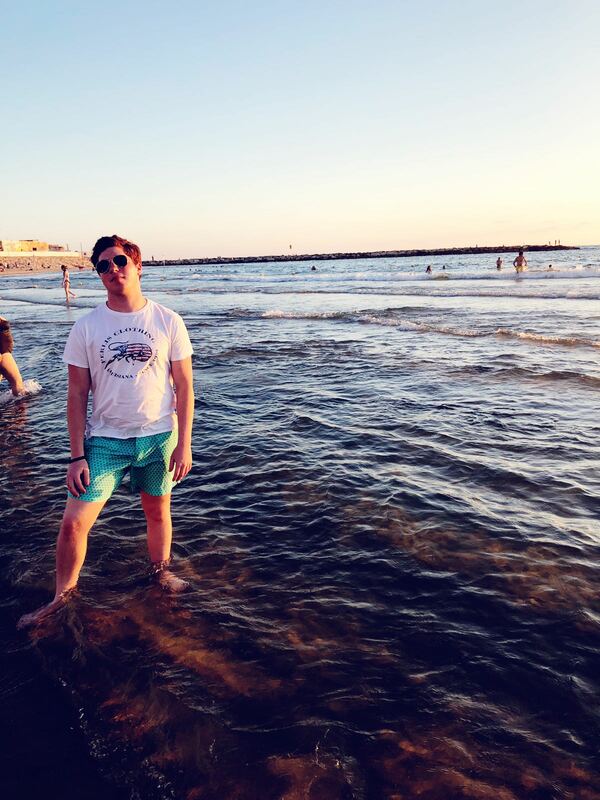 Bradley Greenberger is a rising Sophomore at Tulane University in New Orleans majoring in Finance and Legal Studies in Business. Brad works for The Floor located in the Tel Aviv Stock Exchange. The Floor is financial technology (FinTech) hub, connecting their partner banks (Deutsche Bank, RBS, Banco Santander, HSBC, etc.) to Israeli Fintech startups to fulfill their technology needs. Brad has had the opportunity to be on the cutting edge of banking, learning about the newest innovations and trends the industry is facing. He has worked on a broad spectrum of projects, written reports, researched startups, taken meetings, and created a database of Israeli Fintech companies. Avocet Greenwell is entering her sophomore year at the University of Pittsburgh where she is an Urban Studies major concentrating in Urban Planning and International Urbanism. 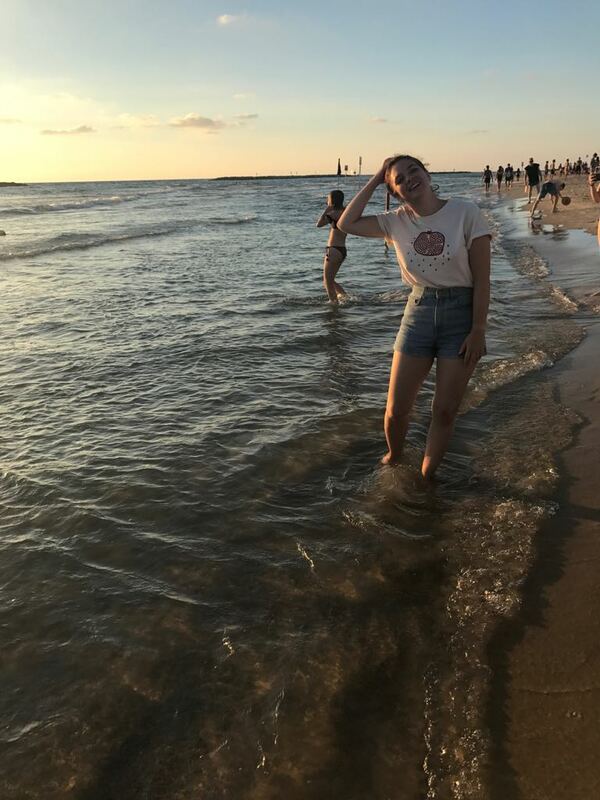 While in Tel Aviv, she is working as a media, marketing, and outreach intern for Fashionating by Liri, a company that strives to promote and present Israeli fashion and designers. She's loving Tel Aviv's plethora of coffee shops and the city's amazing public transit. Sam Myers is going into his third year studying marketing at the Ohio State University. In Tel Aviv, Sam works at Mindspace, which is an international coworking space company. At Mindspace Sam is a marketing intern and he assists in making creative content, digital asset management, and market research. He says Mindspace is a rapidly growing company so there are always plenty of fun projects for him to do. 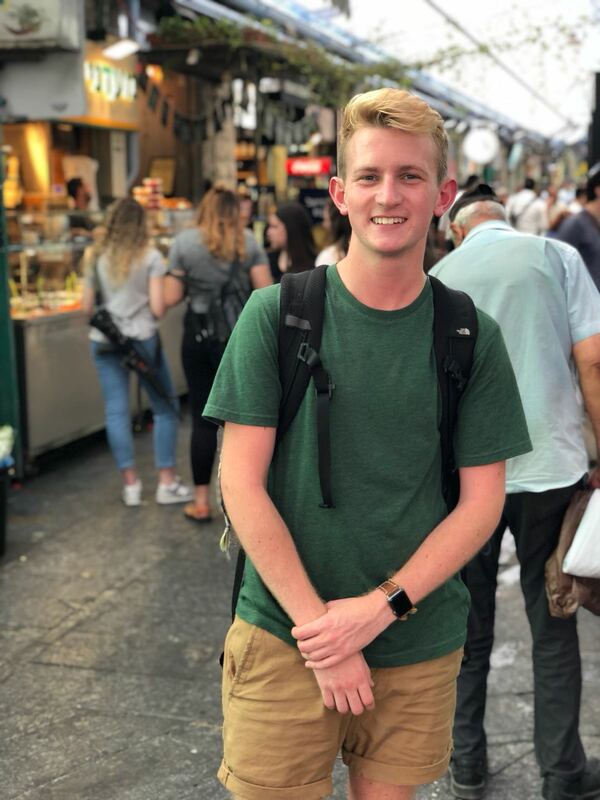 Michael Edelheit is a junior at University of Cincinnati where he studies Information Systems and International Business. During his time in Israel, Michael has been interning at Media Shakers, a video advertising company. Michael helps with monitoring and optimizing success rates of client campaigns. He enjoys what he’s learned so far at Media Shakers, and plans to utilize these skills to pursue his next internship in Cincinnati. After a week full of traveling and meeting new people, this week started off with a change of pace. We all got to take the day off from our internships on Sunday (a typical work day in Israel). Many of us took this time to sleep in and enjoy our mornings with a nice cup of coffee, and then headed to our favorite spot, the beach. This was the perfect day to relieve any stress or to just hang out before we headed back to our internships on Monday. Over the weekend, a few members of the group finally got to go on their breakout trips. Maddie Smith visited the Hava & Adam farm in Modi’In to learn about ecological farming, sustainable living, andpermaculture. She said her favorite part was being able to hike through the woods during a survival skills course. She was blindfolded, and had to find her way back to the meet up spot using senses other than sight. She also enjoyed the fresh vegan food grown and cooked on the farm. Jordan Seibold not only went on her breakout trip this weekend, she also got to celebrate her birthday there! Jordan spent the weekend in the northern part of Israel getting back in tune with nature. Jordan went on beautiful hikes, ate campfire meals with the group, and even slept under the stars. 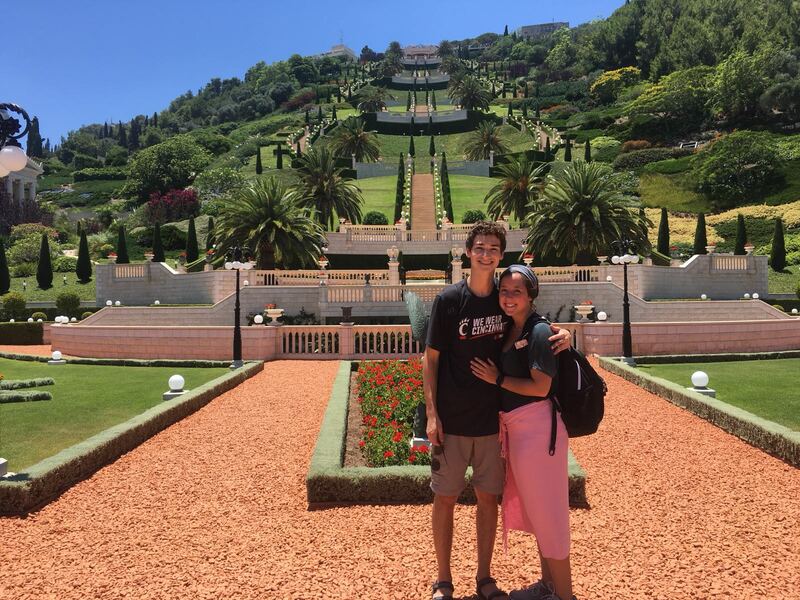 Cameron Foy and Bradley Bolotin visited a campground in the Galilee region with a group called the Hashomer HaChadash. Hashomer HaChadash’s mission is to cultivate, protect, and revitalize Israel's agriculture. At the campground the two trimmed olive trees so that they could be ready for harvest. They also went to the only all-organic farm in Israel where they raise cows, chickens, and honey bees! Cameron said at the campground all the lights turned off at 10pm and the sky was absolutely littered with stars, which gave them the opportunity to learn about constellations. On Friday, members of the group who had already done their Break Out trips a few weeks ago, had different activities to participate in called Weekenders. Weekenders are activities around Tel Aviv that let us explore and learn in various ways, but they only last a few hours whereas Break Out sessions are a full weekend. Some of the group went on a graffiti tour of the Tel Aviv neighborhood, Florentine. Florentine is known for their graffiti covered buildings, and sometimes the pieces look like real art. Other members of our group went on a photography tour in Tel Aviv, and got to take pictures and experience the city through the eyes of a photographer! A few other members of the group went on a tour called “Herstory.” Which was about four Israeli women in Tel Aviv who had an impact on the history of the country. This tour was focused only on the women in history though, and the name was a play on the word history, because it is often looked at as “his-story," and dominated by males. After our activities, we spent the last of our weekend relaxing in the sun on the beach. A few of us went out to dinner on Saturday night to a restaurant called the Old Man & the Sea. A restaurant right on the marina in the Jaffa Port. The restaurant is very well known in Tel Aviv for their meal deal which is twenty unlimited salads and pitas! You can also pay a little bit extra to get meat or seafood on the side of your meal. The food was delicious and the restaurant has a beautiful view! After dinner several of us were reconnected with Kali Cohen, a young woman who is also from the Cincinnati community, who made aliyah and currently lives just outside Tel Aviv. 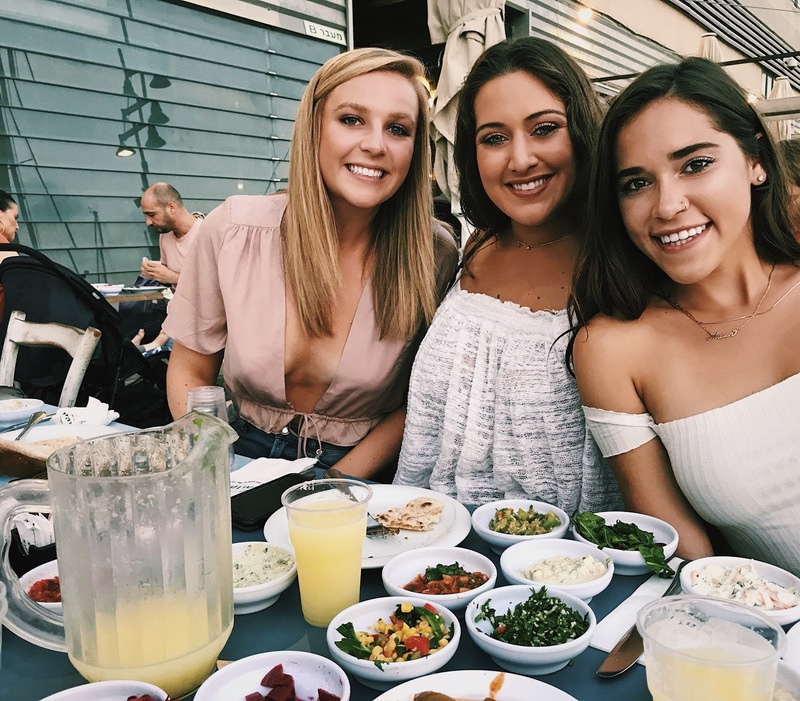 She gave us some ideas on how to spend the rest of our trip and also some tips on Tel Aviv living. It was really fun getting to see her and hear all about her experience actually living in Israel. Now we are heading into week 6 and I can’t wait to tell you all about our upcoming trip to the north in my next post!